Cardiff City striker Robert Earnshaw has joined Major League Soccer club Toronto. The 31-year-old Wales international confirmed the move on Twitter, posting: "Breaking news: I have now signed and officially a @Torontofc player." 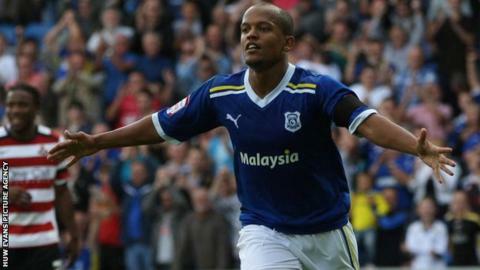 Earnshaw has not featured for the Bluebirds, who lead the Championship by eight points, this season. Earnshaw rejoined Cardiff, where he began his career, on a free transfer from Nottingham Forest in July 2011. He had a loan spell at Israeli side Maccabi Tel Aviv towards the end of 2012, but returned to Cardiff in the new year. Toronto's season kicks off on Saturday at Vancouver, so Earnshaw will fly to the Pacific Coast city to meet his new team-mates. Via Twitter, he added: "I want to thank my home town club Cardiff City, I had the best fun playing in front of those fans from the age of 16 until now. "I leave with a heavy heart from Cardiff City. I hope we created memories and I tried to give everything I had when I played. "I will remember the journey that we went through."